Location. 44° 10.093′ N, 73° 15.095′ W. Marker is in Vergennes, Vermont, in Addison County. Marker is at the intersection of Main Street (Vermont Route 22A) and Park Street, on the right when traveling west on Main Street. Touch for map. 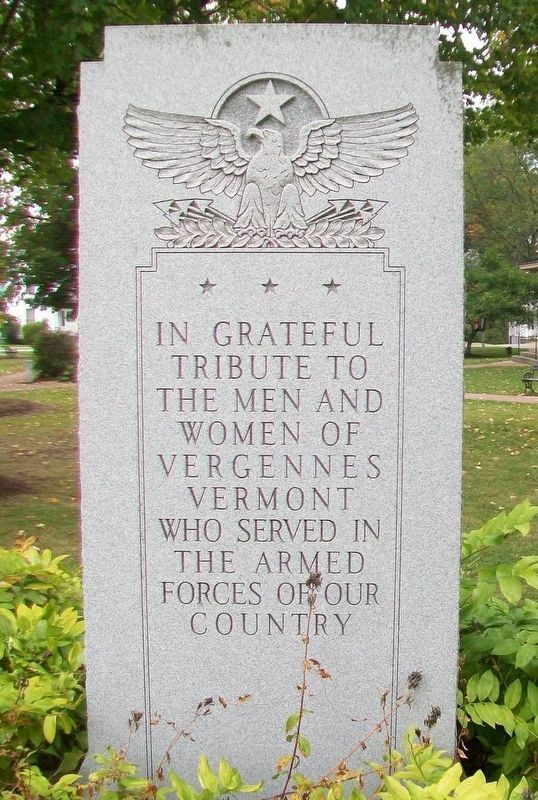 Marker is at or near this postal address: Vergennes City Park (Town Green), Vergennes VT 05491, United States of America. Touch for directions. Other nearby markers. At least 8 other markers are within walking distance of this marker. 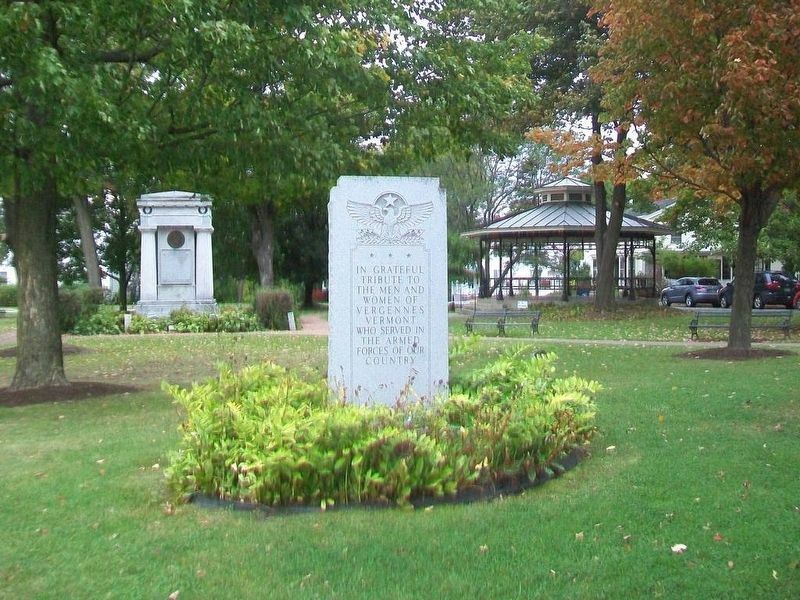 Vergennes 150th Anniversary (a few steps from this marker); Commodore Thomas Macdonough (within shouting distance of this marker); The Bixby Memorial Free Library (about 600 feet away, measured in a direct line); World War Memorial (about 600 feet away); Early Life Along Otter Creek in Vergennes (approx. ¼ mile away); The Vergennes Pump House (approx. ¼ mile away); Commerce at the Crossroads (approx. ¼ mile away); Macdonough Shipyard (approx. 0.3 miles away). Touch for a list and map of all markers in Vergennes. Credits. This page was last revised on October 24, 2017. This page originally submitted on October 24, 2017, by William Fischer, Jr. of Scranton, Pennsylvania. This page has been viewed 83 times since then and 5 times this year. Photos: 1, 2. submitted on October 24, 2017, by William Fischer, Jr. of Scranton, Pennsylvania.